Corporate Social Responsibility, while has always been around as a business philosophy in some form or other, has recently increased in use as one of those dreaded business buzzwords. Whether you love or loathe buzzwords, the issue of corporate social responsibility is huge in businesses of any size. Corporate Social Responsibility (or CSR) is the way that business is conducted whilst taking regard to the wider social context. CSR means taking account of social, economic, human, and environmental impact. This is usually done on top of what is required as standard by regulators. The aim is to minimize the impact on others, such as by promoting environmental sustainability or by ensuring human stakeholders are not exploited. What are the benefits of corporate social responsibility? Basically, if your business is playing nicely, its reputation will improve and you will win more friends. This will have a positive impact on many areas of your business, including…. All of this should lead to an improvement in financial performance, even if some of the programmes you need to pursue in the name of CSR don’t seem initially to have a positive net value. 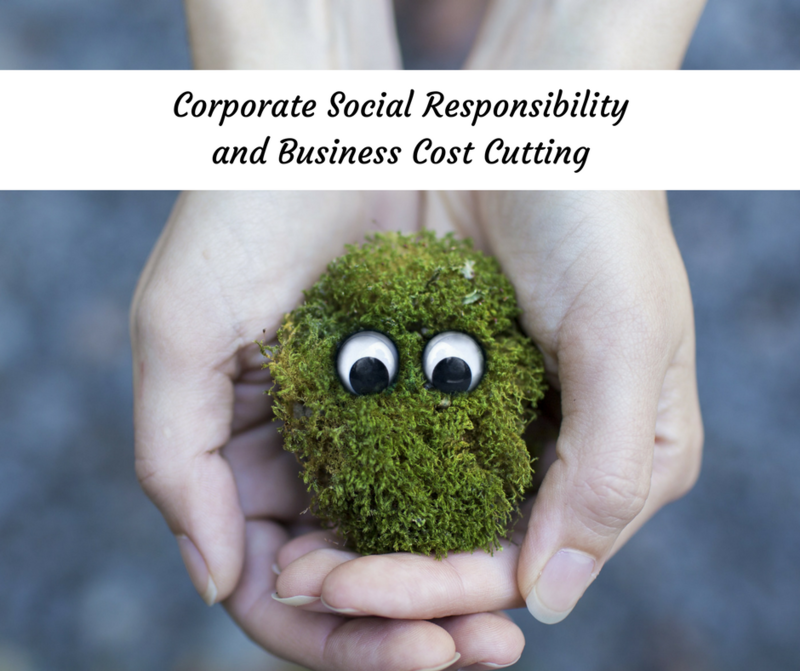 On the face of things, cutting costs in business doesn’t necessarily align with the values of CSR. In many cases, scrimping on spending may be detrimental to the CSR cause, particularly where the cost-cutting involves your human assets. However, there are instances where cost cutting can be a valuable CSR and PR exercise, and where these exist, you should take some advantage of this double blessing. There is a danger that too much shouting about what you are doing makes people cynical about exactly why you are doing something, but with care, blowing your own trumpet can be a great idea. For example, if you’ve embarked on a programme of reducing energy use in your business, then this will not only save you money but also save energy which is good for the wider environment. This is absolutely CSR and you should publicise this on your company literature, even if it’s more of an aspiration than something you’ve already achieved. Microsoft has pledged to reduce carbon emissions by 75% by 2030. This may not be achievable, but the fact that they are at least working towards it shows an appreciation of the wider community and a commitment to doing things with less impact on others. If nothing else, it’s a great excuse for others to write about you. Other ways you can get Brownie points from the consideration of your company’s energy use is by investing in renewable technology such as solar panels or wind turbines, or by buying your energy from ‘green’ energy companies. These individual projects may not result in a net gain by themselves, but as part of a wider CSR programme could improve perceptions of your brand and improve your financial performance. Reducing the waste your business produces is a good way of minimising your impact on the wider environment, and one which can be very news-worthy. You could reduce your waste in so many different ways, whether this is by reusing and recycling more or selling your waste so it can be reused by someone else. If you can reduce the waste you produce, and subsequently the money you have to pay to ethically dispose of this waste, then you have both a cost-saving measure which is also good for a bit of PR. There is so much more to Corporate Social Responsibility than reducing your impact on the environment by reducing your energy use, but you should certainly think about the impact any of your activities have on the wider community whether you’re embarking on a business cost-cutting exercise or not.